Regifting and how to get it right, (if you’re going to do it!). 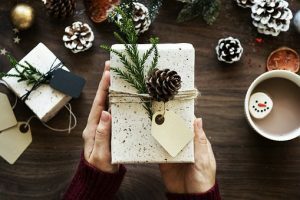 Is passing on an unwanted present plain bad manners or actually a savvy way to save money and recycle to find a new home for an unwanted or duplicate gift? Four out of ten of us admit to ‘regifting’ some of our gifts according to research from gadget insurance provider Protect Your Bubble. Whether you do this or not is up to you, but, if you are going to ‘regift’ anything make sure you stick to the rules or you could be banished from the Christmas list next year! So if you are going to regift here’s how to do it and get away with it! Sounds obvious, but make sure you take off the original tags before rewrapping, tagging it and handing it over. And check inside boxes for rogue tags too! Several years ago a friend of mine was given a lovely box of wine glasses by her ‘prospective’ sister in law, only for her to open the box and find the original tag inside wishing the sister in law a ‘Merry Christmas’ along with a gushing message from the original sender. Needless to say the incident didn’t go down well! Check dates on wrapped boxes of biscuits and chocolates and the expiry date on vouchers if you’re thinking of passing on a voucher or gift card that you can’t use. You won’t look great if it’s later discovered that your ‘generous’ gift actually expired last year. And as some gift cards or vouchers may only last 6 months it’s definitely worth double checking first! Don’t hand over gifts that look like they’ve been in the back of your cupboard or with tatty shrink wrapping or you could be rumbled! Always make sure the wrapping and packaging all looks new before you wrap it up again! Goes without saying, but don’t pass on homemade gifts, unless they’re your own creation of course! Check who gave you that gift before you hand it back; especially if it’s something you were given at last year’s office ‘Secret Santa’. I’ve always been lucky with ‘Secret Santa’ and had some lovely fun gifts but if you’ve been given a matching stapler and hole punch set; (and no reason of course why you shouldn’t be super happy with this! ), then don’t be tempted to pop it back in the ‘Secret Santa box next year in case it ends up back in the arms of the original present giver! ← Why it always pays to shop around for home insurance. For weekly finance and shopping tips and advice to help you save money and keep you safe online. © 2017-2018 Sue Hayward. Privacy - All Rights Reserved.